A solemn crowd gathered today on a crisp clear autumn Veteran’s Day to honor the memory of 1st Lt. Ronald D. Winchester, USMC. 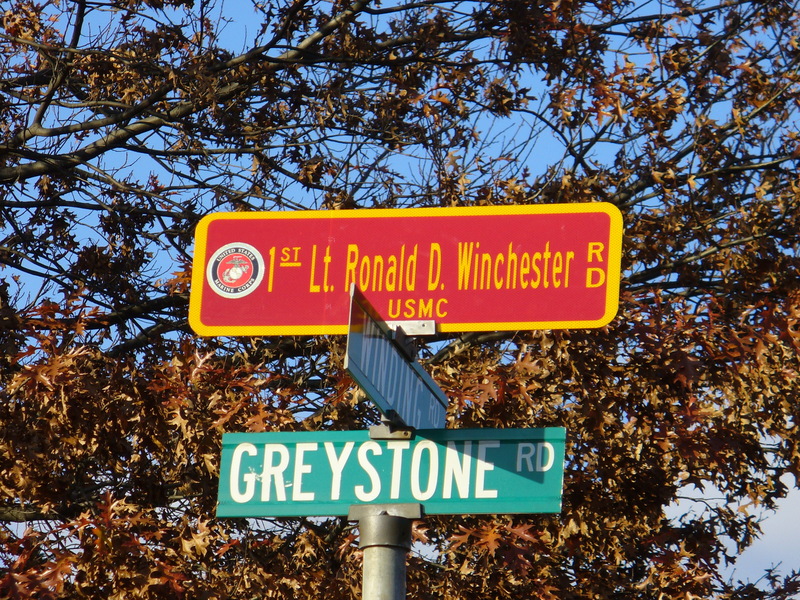 The Village of Rockville Centre co-named the street on which he grew up as 1st Lt. Ronald D. Winchester Road. The beautiful new street signs were specially designed in Marine Corps colors with a red background, gold lettering and the Marine Corps emblem. Many neighbors, friends and classmates joined the Winchester family for the moving ceremony. Village Mayor Mary Bossart, all three village trustees as well as the village fire and police chiefs were present. State Senator Dean Skelos, County Legislator Joseph Scannell, color guards from two Marine Corps League detachments, Leatherneck MC riders, American Legion, VFW, Patriot Guard Riders and Gathering of Eagles rounded out the crowd. A bagpiper from the Nassau County P.D. Emerald Society played between speechs. The ceremony opened with a beautiful rendition of the Star Spangled Banner sung by Emma Siegel of South Side High School. Master of Ceremonies, Lt. Charles Gennario, Rockville Centre P.D., Lt. Col. USMC (Ret’d) did an outstanding job with the final organizing and making an emotional speech outlining the similarities in his own youth and Marine career path and that of Lt. Winchester. Many eyes teared up during the moving speeches by Mrs. Marianna Winchester, Ron’s mom, and Capt. Douglas Larson, Ron’s best friend and team mate from Chaminade High School. Fr. John McCarthy of St. Agnes Cathedral Parish, himself a twenty year U.S. Navy veteran, provided the invocation and blessings of Lt. Winchester, his family, the attendees and all our servicemen and women serving in harm’s way. The ceremony was followed by a fabulous repast, donated by Buscos Deli, in a large party tent erected on the front lawn of the Winchester home. A photo album from today’s event is here. Thank you to Alice of the Patriot Guard Riders for adding her photos to my own. Lt. Winchester is also remembered each April with the Walk of Honor which visits many of the leading pubs in Rockville Centre. Our report on last years 3rd Annual Walk of Honor is here.